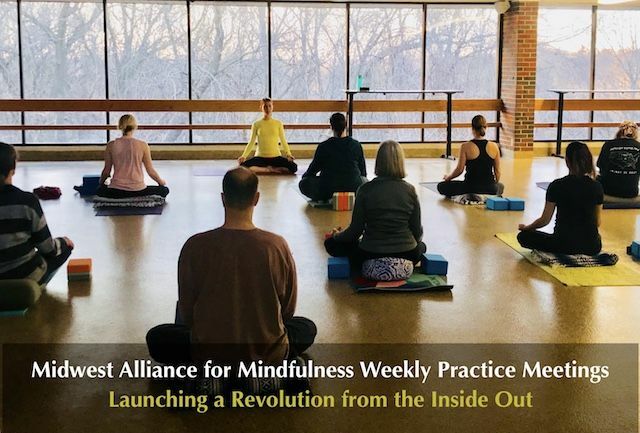 The Midwest Alliance for Mindfulness offers a weekly practice meeting led by a rotating group of trained mindfulness teachers. It begins with gentle mindful movement to prepare the body for stillness, shifts into a period of minimally guided meditation, and ends with inquiry and discussion. Wear comfortable clothing and bring your yoga mat and meditation cushion if you have them. A limited number of folding chairs, mats and cushions are available to borrow. Free to members. Non-members can purchase a pass: single passes are $10 or multi-class passes offer a discount.